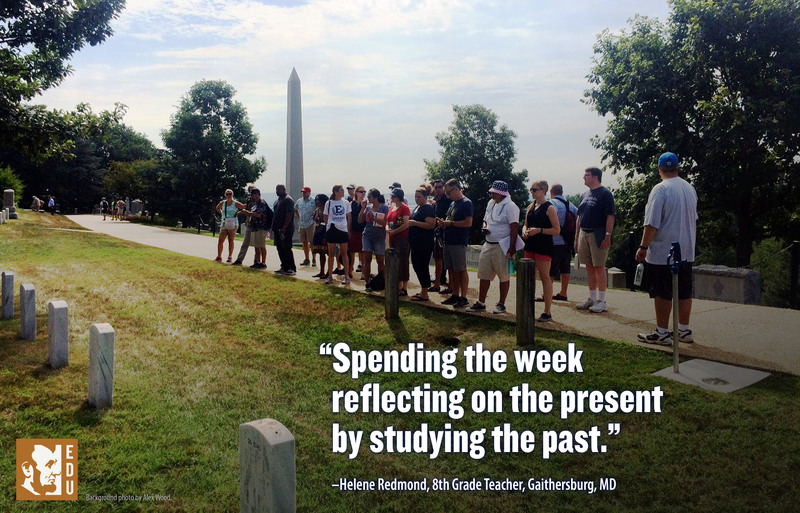 The Seat of War and Peace is a week-long professional development program for teachers, focusing on Reconstruction and Civil War Memory through the study of monuments and memorials in Washington, D.C. When Ford's Theatre first offered The Seat of War and Peace in late June and July of 2015, the Ford’s education team was excited to explore Lincoln’s legacy through Reconstruction. We had an awesome line-up of scholars scheduled to present to our 72 participants over two weeks. But we never could have anticipated that just a couple weeks before our first session, the country would be reeling from a tragedy. On June 17, 2015, nine African Americans were massacred by a white supremacist in the Emanuel AME Church in Charleston, South Carolina. It’s nearly impossible to separate our present, personal perspective from the history we study. I confess: we were not prepared to teach and discuss the legacies of Reconstruction with a group of teachers from around the country in the wake of that tragedy. We learned (the hard way) that current events are still closely and emotionally linked to history that happened 150 years ago. It’s nearly impossible to separate our present, personal perspective from the history we study. So, we made some dramatic changes to the agenda for the following year. We cut the daily schedule from 10- and 12-hour days back to eight or nine hours (exhaustion doesn’t help us process divisive topics). We housed and fed our teachers together to encourage community-building. We built in time for daily reflection and cushion-time between activities to allow for some flexibility if the conversation was too good to stop. The next summer, America was in the thick of the passion-igniting and divisive 2016 presidential campaigns. The Black Lives Matter movement dominated national news. Just a couple weeks before we were scheduled to begin, a sniper killed five people and wounded 12 amidst a Black Lives Matter rally in Dallas, Texas. Once again, we were teaching and learning about Reconstruction in a thicket of real tragedy and tension — direct legacies of Reconstruction. While I am pleased to report we did not stumble into any overt, dialogic catastrophes that summer, we still found ourselves grappling with questions that had no prepared answers and navigating intense waters. We received post-program feedback about our (the facilitators’) perceived biases. We learned that some teachers felt their opinions would be unwelcome in discussion—mortifying when we intended to create a safe space for everyone. How could we ensure participants would feel comfortable speaking up and would feel heard, even if presenting a dissenting opinion from others? Teachers at Arlington Cemetery. Photo by Alex Wood. So, the next year we introduced group norms for civil discourse to establish a safe and respectful learning environment. I added completing an Identity Chart to our opening session, an activity I learned from Facing History and Ourselves, to encourage participants to articulate and acknowledge the unique points of view they each bring to the learning community. 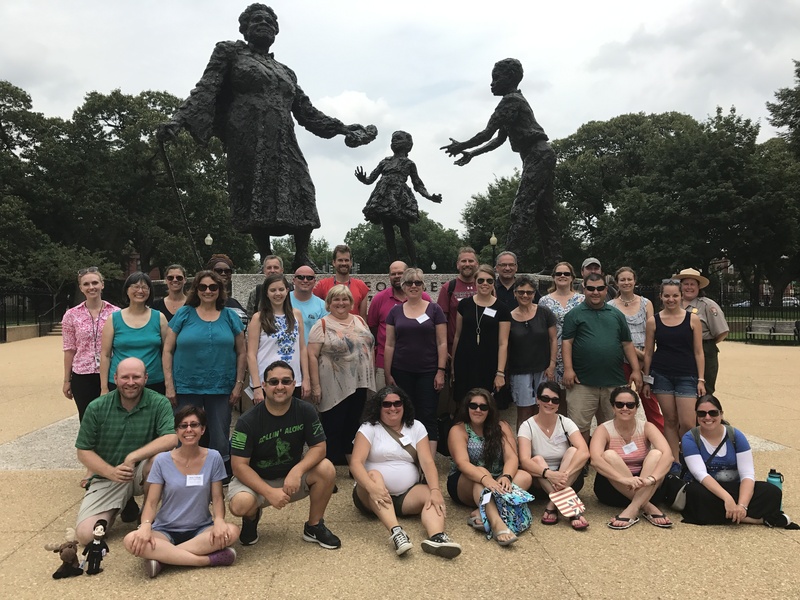 The Seat of War and Peace 2017 teachers and facilitators, in front of the Mary McLeod Bethune Memorial in Lincoln Park, Washington, D.C. Meanwhile, current events continued to inform our program. In May 2017, New Orleans removed its Confederate monuments. Then-mayor Mitch Landrieu delivered a speech explaining why he believed the change was necessary. We changed the syllabus at the last minute to include Landrieu’s speech. A couple of weeks after our 2017 program concluded, the violence in Charlottesville happened. We knew that it would influence our conversations and planning for 2018. Through experience, we have learned a few important lessons. First, we have learned that because debates on how we remember Reconstruction are ongoing, we must constantly update the content of our program. In addition to the historical speeches we examine in the program, we’ve added Mayor Landrieu’s speech as an example of a contemporary primary source. We review and switch out the articles assigned as pre-reading each year to reflect the national and academic dialogue happening now, not just five years ago. By modeling discussion on current events and topics, we hope to embolden teachers to do the same in their classrooms. Teachers ... introduce me to new ideas, remind me of nuances, help me check my bias and break out of my bubble. Second, we learned it is critical to be honest and open about our own unique perspectives. Most teachers are expected to maintain their classroom as a neutral space, just as many museums are revered as neutral spaces; but neither are actually neutral. Each one of us brings our unique life experience, the opinions we’ve formed, the prejudices we carry and the questions we ask into every space. We must be open and honest with ourselves and others about whether we are presenting evidence or making persuasive arguments. This transparency influences the credibility of our sources and ourselves. Transparency is also crucial when discussing inherently political topics, those of 150 years ago and today. We encourage teachers to question us, one another and our scholars by asking for primary sources to back up claims. Our 2017 teachers participating in the “Unity” reflection exercise. Photo by Alex Wood. Third, we have reaffirmed the importance of reflection—something we integrate into all of our programs. We find this especially critical when tackling difficult history. In our program, we reflect in several ways: we offer daily oral reflection as a group, and nightly written reflection on a closed online platform. 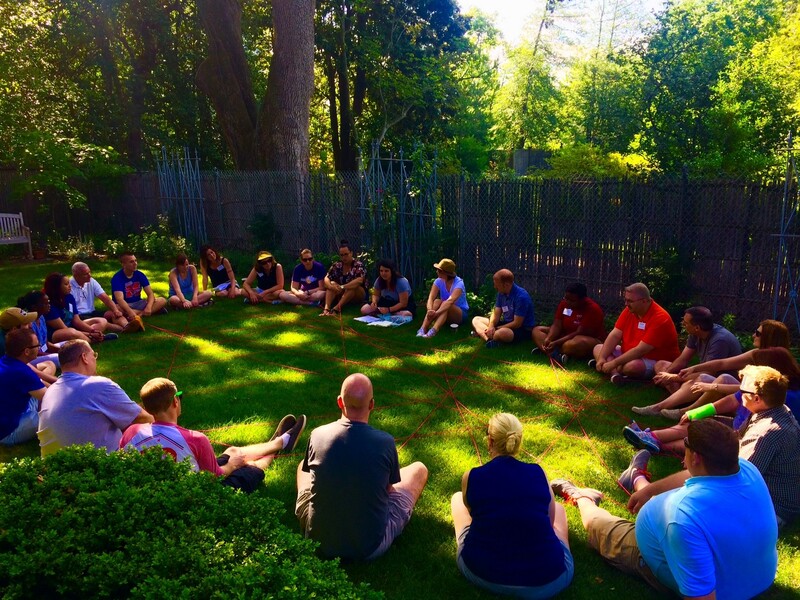 We also offer facilitated, prompted reflection through an exercise called “Unity,” which we learned from our partners at President Lincoln’s Cottage. Reflecting together daily helps us connect the content throughout the week, and process our personal responses to our learning. I’ve learned it’s not enough for us to just learn from the previous year and make small adjustments. As the host museum, we must recognize that we are not the end-all-be-all authority on the content. We are participants in these discussions as much as we are the facilitators of them. I have learned a lot from the 146 teachers who have been on this journey with me so far. They introduce me to new ideas, remind me of nuances, help me check my bias and break out of my bubble. I’m curious and anxious about what will happen between now and July 2019, when we begin The Seat of War and Peace for our fifth summer. But after four unique summers, I am feeling confident that we have built a strong foundation upon which we can grow, be nimble and be responsive. More importantly, I am confident that we have the humility to recognize that we will learn even more from our teachers this summer and continue this journey together. Alex Wood is Education Programs Manager at Ford’s Theatre. Her favorite part of her job is the summer professional development programs, because year after year she continues to learn something new. Follow her on Twitter @xela415, and Ford’s Education @FordsEdu.